At Waterman Winery & Vineyards, we are committed to preserving the Earth for generations to come. That is why we implement sustainable, eco-friendly practices into everything we do. We are proud to be a sustainable business, offering natural wines handcrafted in Northern Illinois. Sustainability and green business practices are very important to our family. We want to provide a healthy environment for the next generation of vintners and wine drinkers alike. 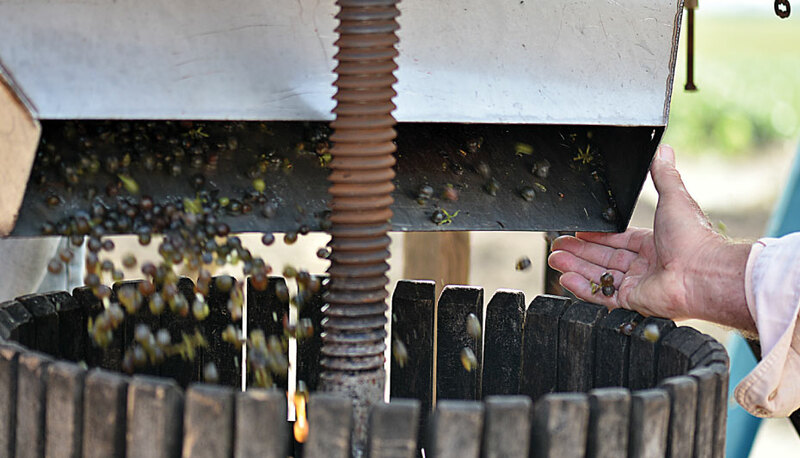 Each part of our process is handled with love and care, from vine to bottle. Our vineyards were developed acre by acre using recycled materials for the trellis system; repurposed fence posts now support the vines. Each part of the winemaking process is done in-house, eliminating the need for trucking of either grapes or juice. This means we can begin fermentation shortly after harvest, and so our wine is made from fresh grapes. Our grapes are homegrown and harvested by hand. Each wine is fermented and cold stabilized in our century-old barn. Our fermentation process occurs naturally and does not require any electricity. We harvest our grapes during the fall and begin fermenting the same day they are picked. During the cool autumn weather, temperatures are just right for natural fermentation. As the winter becomes colder, the wine naturally chills without electricity. Slowly chilling the wine allows some of the acids to precipitate out, naturally reducing the acidity of the wine, and giving it balanced flavor. At Waterman Winery & Vineyards, no organic matter goes into a landfill following processing. After we ferment the grapes, we return all the remaining organic matter to our vineyards or surrounding farmland — the grape stems, seeds and skins all go back into the fields. This helps enrich the soil and prepares it for another season of grape, corn or soybean production. We bottle everything by hand, helping us conserve water and energy along the way. We hand-wash and hand-cork each bottle. Our process uses a minimal amount of electricity. The vineyards are grass-covered which protects the soil from the elements and provides a rich, varied habitat for wildlife. A healthy environment means delicious wine. Grapes are sensitive to herbicides and cannot thrive around the weed-killing sprays that many farmers use. We do not use chemical herbicides and use only a minimal amount of pesticides. We also farm the land around our vineyards, so we know how the surrounding crops are treated and the impact on our environment. We have created a natural creek-fed fish pond at the eco center of our vineyards to help nurture our grapevines. We believe this water source and the aesthetic setting are both essential to our growing process. We are always exploring new approaches that are better for our environment. That is why we are experimenting with an organic vineyard. We have dedicated a section of our vineyards to development of wines that are even more sustainable, glass after glass. Waterman Winery & Vineyards is located on Tuntland Farms, a fourth generation operation based on sustainable activities, implemented before ‘sustainable’ was cool. Sustainability must be an ongoing process with each generation adding new knowledge and improved skills. Our sustainable activities include planting hundreds of trees; maintaining grass waterways; participation in the Illinois Acres for Wildlife and Roadsides for Wildlife initiatives; participation in the Conservation Stewardship Program and The Illinois Wind Energy (FP&L) wind-farm project; minimum (or no) tillage; and precise GPS fertilizer application. Over 50 years of stewardship and conservation have created a productive and healthy environment. Tuntland Farms received a DeKalb County Sustainable Agriculture Award from the DeKalb County Soil and Water Conservation District. To enhance the farm operation, sustainable vineyards were planted in 1998; the winery and vineyards represent another sustainable venture. Located near a creek, the vineyards help to stabilize the soil. The vineyards trellis system is made of re-used materials. Equipment for the vineyards is dual purpose, also used on the farm. Use of chemicals is limited. We begin the winemaking process within minutes of harvesting our grapes, without trucking or refrigeration. Inside a vintage barn, the wines are fermented in reusable stainless-steel tanks and later bottled by hand. Thus, the whole winemaking process takes place on the farm. 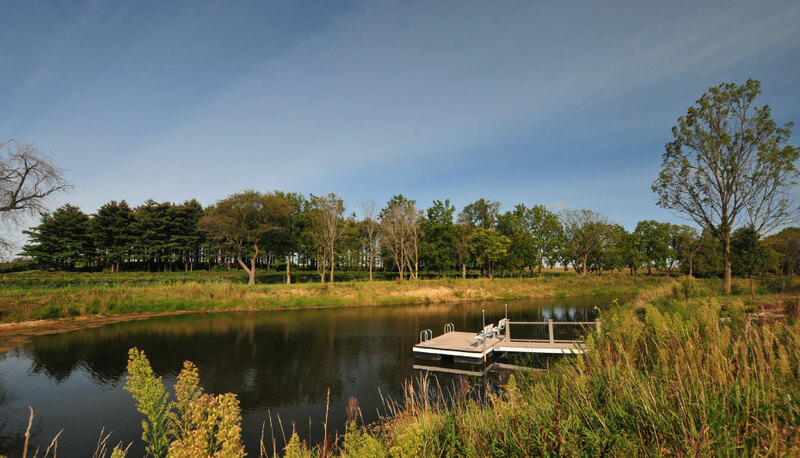 Visitors can enjoy seeing a productive, sustainable Illinois farm and can sample and purchase wine made by Waterman Winery & Vineyards. Sustainability at its best! Our bottles are proudly crafted in America.